Note: Photographs by Tim Roy unless otherwise credited. 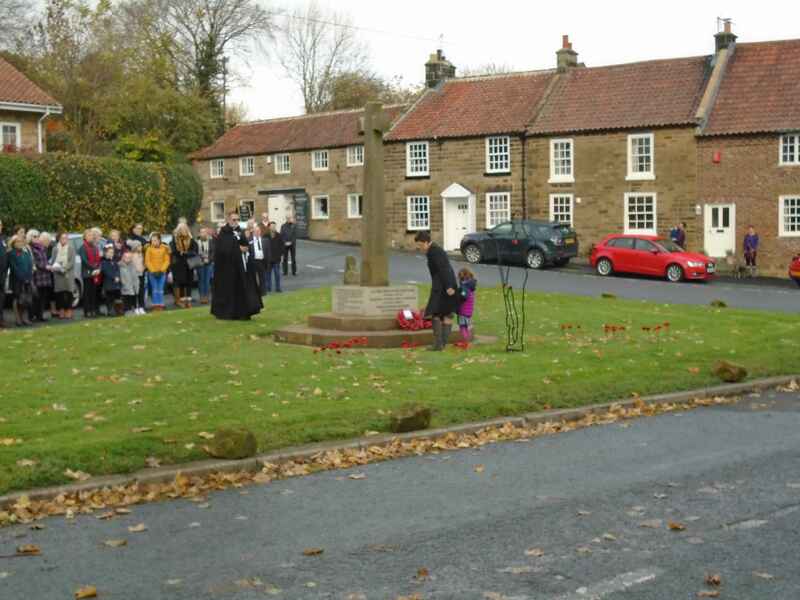 Possible arrangements for Remembrance Day 2018 including a display in Ingleby Cross Village Hall were discussed at the meeting of Ingleby Arncliffe Parish Council on 25th May 2017. 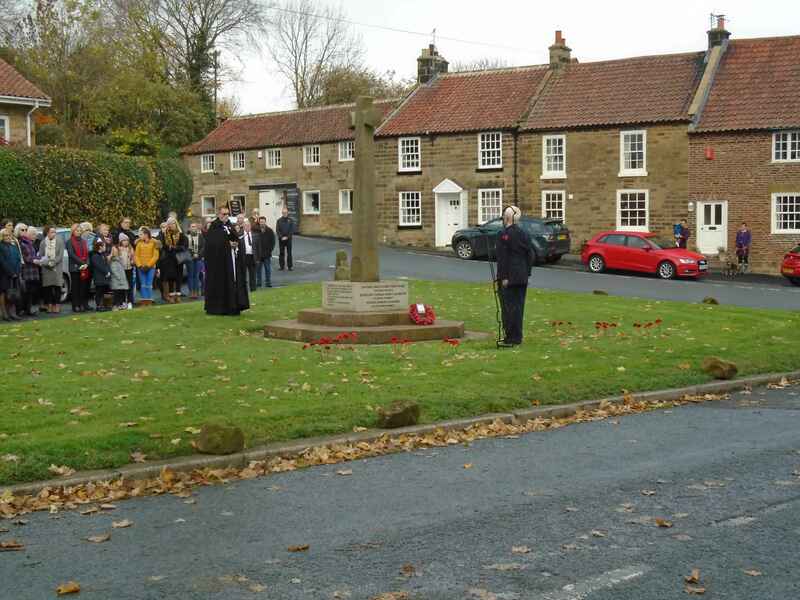 Each year the Service of Remembrance and Act of Remembrance alternate between East Harlsey and Ingleby Arncliffe/Ingleby Cross. The latter were due to host in 2017. 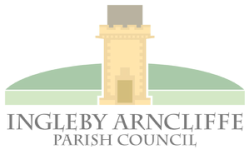 In July East Harlsey Parish Council kindly agreed to host for the second year running in 2017 so that Ingleby Arncliffe/Ingleby Cross could host in 2018. 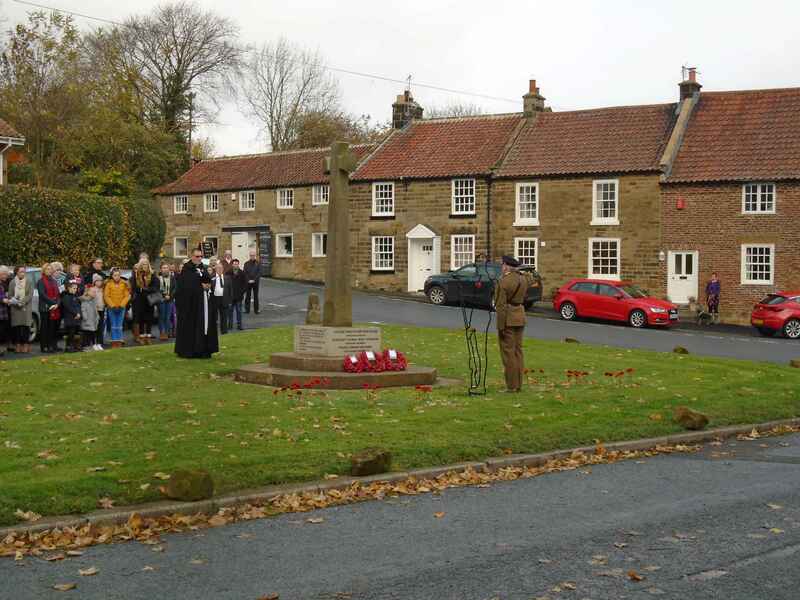 In January 2018 the programme for Remembrance Day was firmed up, and was to include refreshments in Ingleby Cross village hall after the Act of Remembrance. In the village hall would be a display giving details of the war memorial and the soldiers commemorated. Several residents began crocheting or knitting poppies for displays near the war memorial and at All Saints church. In February 2018 the “Remembered” charity announced the “There But Not There” initiative, whereby communities could purchase 6’ Tommy sculptures, life size Perspex pew silhouettes and engraved Perspex name blocks to help commemorate the centenary of the end of the First World War. Proceeds would go to several charities including "Walking With The Wounded", "Combat Stress" and "Help For Heroes" that support serving and former members of the Armed Forces especially those suffering from mental disabilities. Our Parish Council was keen to promote this initiative as long as funds were raised by members of the local community; and processed via the Parish Council’s bank account so that all transactions would be fully auditable and VAT could be recovered on purchases. 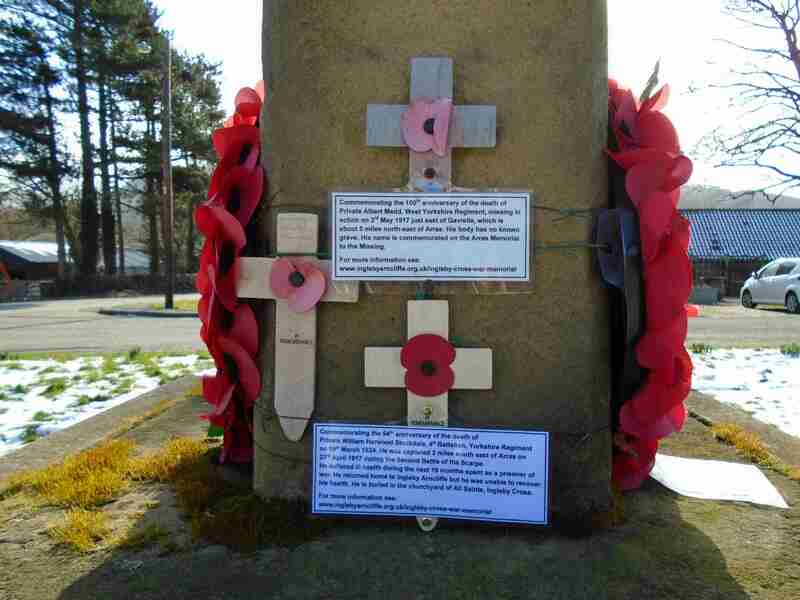 The wooden crosses had become dilapidated and it was proposed to install on the war memorial a brass plaque for each soldier engraved with words similar to those on the laminated notices. Quotes were obtained for the purchase and installation of all of the items, and David Warhurst kindly printed off over 150 fundraising leaflets that were delivered by Parish Councillors and the Parish Council Clerk to every household in July. In a marvellous response over £1,200 was initially pledged, enough to purchase and install one 6’ Tommy and purchase 5 pew silhouettes and engraved name blocks. Pledges were then gathered in by Ruth and Gerry Eastham, processed by Susan Stephenson, Parish Council Clerk and Responsible Financial Officer, and orders were placed. And from Pat’s Cousin Michael LeRoy, Great Nephew of Sergeant Adamson, on behalf of his late Mother, Florence Muriel LeRoy, ne Adamson, Niece of Sergeant Adamson. Local builder Anthony Nelson cast the concrete base for the 6’ Tommy. Stainless steel drop-in anchors, security bolts, washers and nuts were purchased along with a padlock. Members of the Parochial Church Council kindly opened the church for public viewing of the displays on the first 2 weekends of November. Six relatives of Sergeant Adamson visited Ingleby Cross and the church on the morning of Saturday 10th November and were given a guided tour of the displays by Tim and Janet Roy. On Sunday 11th November the Service of Remembrance and Act of Remembrance were taken by the Reverend Bill Dewing and were very well attended with just over 100 residents at the war memorial. It was very touching that also present were relatives of Captain Pease, Sergeant Adamson and Private Stockdale. Many people then took refreshments in Ingleby Cross Village Hall that had been kindly prepared by Ernie and Winifred Laking, with help from Clifford and Sue Rudd, Ruth Eastham and Janet Roy. Members of our community and our visitors raised a significant amount for the Royal British Legion through the "poppy tins" (£358.93), the collections at All Saints Church and the Act of Remembrance (£231.00) and from the sale of refreshments at the village hall event (£170.00). The total came to £759.93. During the week after Remembrance Day all of the displays were packed away ready for the following year. After all of the “There But Not There” bills had been paid, the remaining funds raised by the community, £142.29, were donated to the “Remembered” charity. 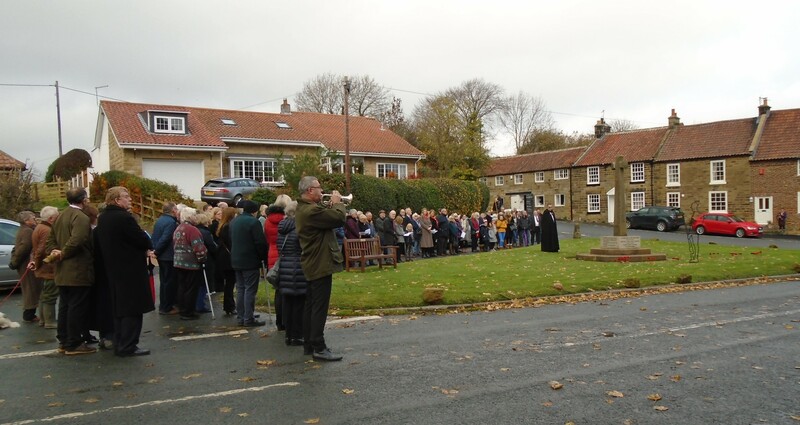 The members of Ingleby Arncliffe Parish Council would like to express their thanks to the many residents who made such an effort to make it a very special and memorable Remembrance period. It was a great community effort.